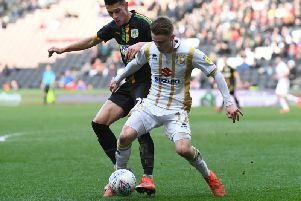 At one stage, they were 27 points adrift of top spot, but MK Dons Ladies put together a sensational 11-game winning streak to be crowned South East Division One champions on Sunday. James Honeyman’s side began the day three points clear of AFC Wimbledon Ladies, knowing a win over Haringey Borough would secure them the title - they won 12-0. It’s the culmination of two years of hard work from the side, having finished second at their first attempt. But having dropped just four points since September, few, least of all Honeyman, could have predicted the way Dons would end their campaign. “It's fantastic. We knew we could do this, we knew we could win the league over the two years,” he said. “We didn’t quite expect to do it in the way we did but it’s exactly what we wanted. “We drew our first game, lost our second and drew two games in September and August, and we’ve won every game since. “We got caught cold in August, 3-0 down after 35 minutes in our first game, and it was the rude awakening I think we needed. “We’ve won 11 on the bounce, and we’ve grown in every game. We won 30 points in 35 days which is an unbelievable feat. We’re all really proud. “At one point we were 27 points behind, and we went top with seven days left of the season. “We knew we were good enough and we knew we could do it. We said we had to win our last 11 to win the league, but realistically we knew we would probably drop three or four points along the way. “We had to go away to Leyton Orient and play at the Matchroom Stadium, Actonians which is tough, Stevenage midweek on a wet pitch, we’ve really had to dig deep to get this done. The game away at Leyton Orient at the end of April, the fifth win in a row, signalled Dons’ intent to win the league though, and gave Honeyman the belief his side could pull it off. Their 12-0 win on the last day of the season was one of three games where the Ladies hit double-figures as they ended the campaign with 76 goals in 22 games. Alice Hughes was named Player of the Year for the team last month, but Honeyman said there were plenty of stand-outs. He said: “There are so many stand-out players. Alice Hughes we got from Nottingham Forest, we were very keen to get her in but I don’t think we had any idea how big an impact she’d have. “Charly Clarke in the centre of midfield as well. On deadline day, we signed Leah Cudone and Kim Farrow because we wanted more goals - Kim got nine in nine, Lea got seven in seven. “Both keepers have chipped in too. The beauty of this squad is that we have nine players who have between five and 12 goals.